Beaute cosmetics is a Canadian makeup brand by Makeup Pro Artist Beau Nelson that was started in 2008.. It is quite a luxury brand and is known to be used by hollywood actresses such as Kristen Stewart, Nicole Richie, Kate Beckinsale, Chloe Moretz, Leslie Bibb, Emma Roberts, Christina Hendricks, Hilary Duff, Dianna Agron, Anna Paquin, etc..
L to R: Neon, Harlot & Fever.. 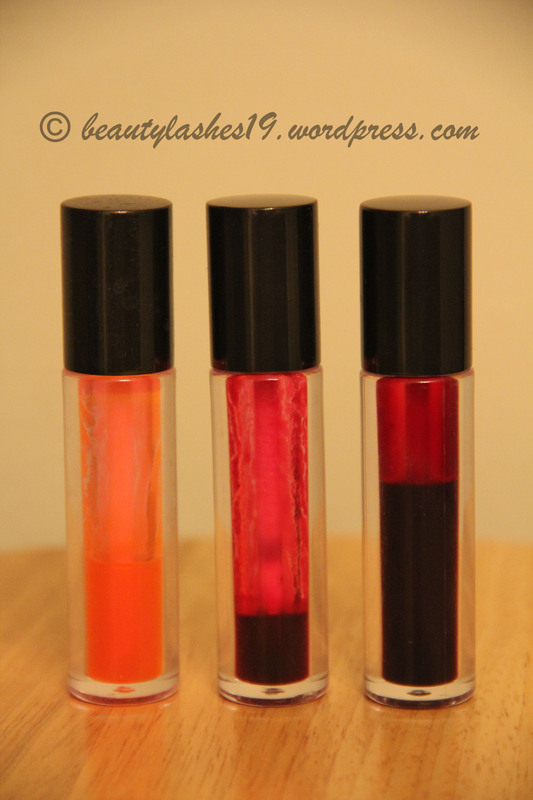 These liqui-stains come in glass packaging and look classy on the vanity table..
L to R: Swatches of Neon, Harlot & Fever.. These retail for USD $29.00 + international shipping charges.. Neon as the name suggests is a bright, neon color! Almost a fluorescent orange in the bottle.. But once you put it onto the lips, it almost adapts and turns into a pinkish orange.. a very flattering color unlike the neon in the bottle! 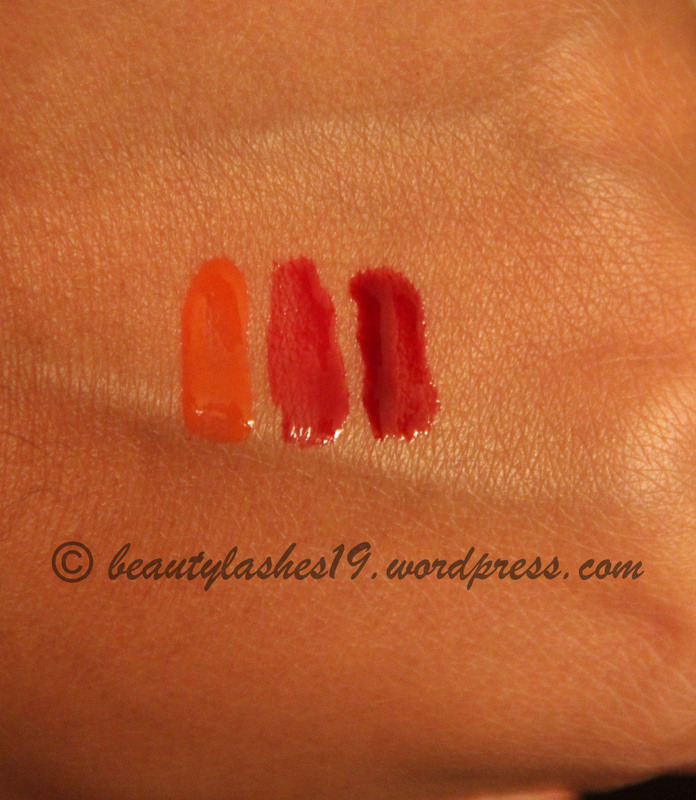 Harlot is a beautiful berry color.. and looks great on any skin tone.. It leaves behind a pinkish-berry stain..
Fever is my favorite of the lot (after Harlot).. This is my second bottle of Fever and I have a back-up for it.. thats how much I adore this shade.. 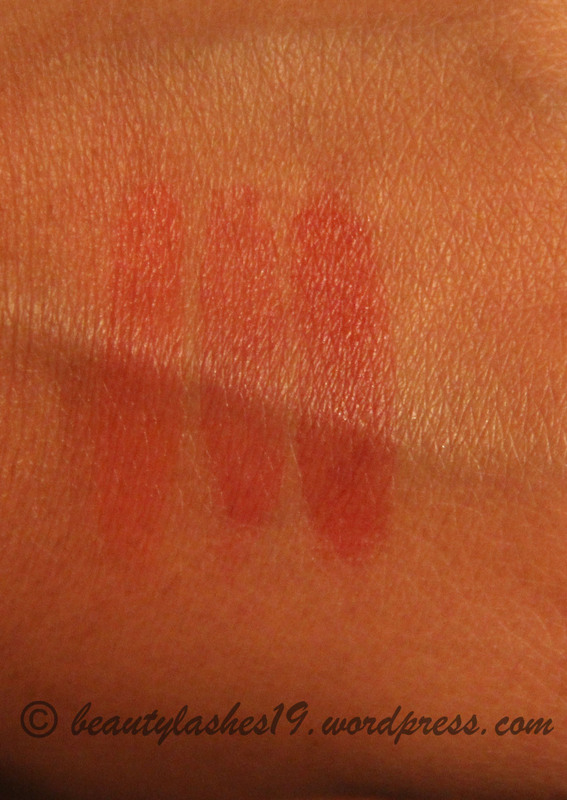 I absolutely love how this color looks on my tan (NC40-NC42) skin tone.. Its gorgeous alone or as a base for red lipsticks to extend their longevity..
L to R: Neon, Harlot & Fever.. Stain that it leaves behind after wearing off.. The product comes with a doe-foot applicator.. However, I don’t use it for application.. 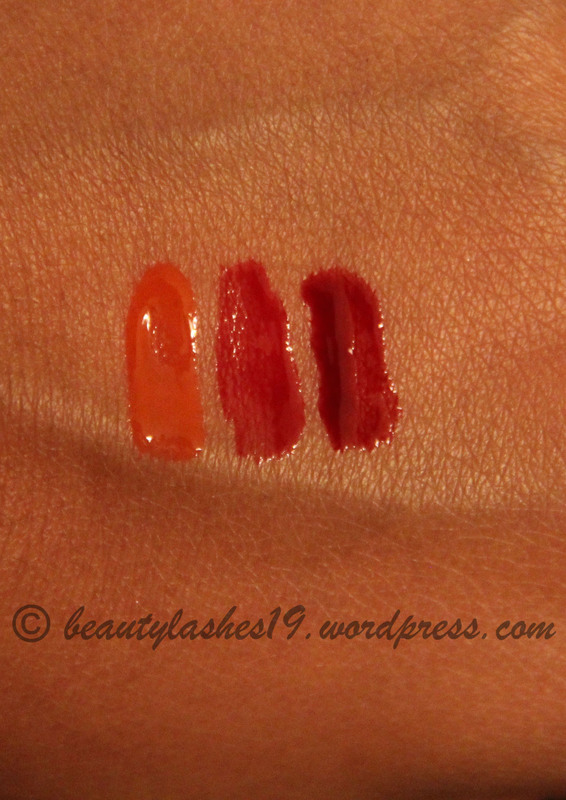 I use a lip brush (Sigma L05) for applying it on the lips.. The number of hours these last on the lip depends on the number of layers you add..
Another brilliant feature of these products is that they can be layered to achieve the depth of color one needs.. Just let the first coat dry before adding the next one.. So, a single shade can give you a range of looks depending on the intensity of the stain.. You could also use these on the cheeks for a long lasting blush.. or use it as a base under your powder blushes.. I absolutely love the versatility of these products.. These will always be much loved in my collection..